The Yamaha R15 V3 is currently one of the best performance oriented 150 cc bikes in India. It is a perfect start bike for those who aspire to master track racing or want to become professional riders. At the other end of the spectrum is the Bajaj Pulsar 220F, which for long has been the ultimate affordable performance oriented bike for the Indian youngsters. However, what happens when both of them are pit against each other in a race. The video below by Ayush Verma shows just that. Let’s take a look at video to see which comes off as the better one here. As seen in the video, both the bikes are fairly capable ones and evenly matched. The end result, therefore does not declare one bike as a distinctive winner. The race was done to test the top end grunt of the bikes rather than the initial acceleration so launch timing is not that significant here. Also, the races done are in a direction opposite to the wind flow, which further affects the top speed of the bikes. 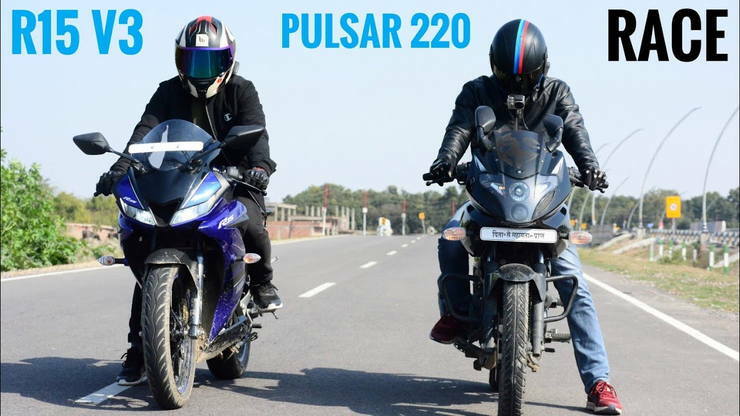 A total of two rounds were conducted in the video among which the first round is won by the R15 V3 while the second round goes in the name of the Pulsar 220F. Talking about the bikes, the engine of the Bajaj Pulsar 220F is the tried and tested 220cc, air-oil cooled unit that produces 21 Bhp of peak power and 19 Nm of peak torque. The engine comes mated to a five-speed manual gearbox. The Yamaha R15 V3, on the other hand, gets powered by a 155cc, four stroke single cylinder engine which churns out 19 Bhp of peak power along with 15 Nm of peak torque. It is mated to a 6 speed gearbox with a slipper clutch as standard. Compared to Pulsar’s engine, the R15’s engine is a very modern unit and comes with liquid cooling, a single overhead camshaft, a DiaSIL cylinder and variable camshaft actuation. The engine is very smooth and loves to be revved to the redline. Now the Pulsar 220F may be more powerful than the R15 in terms of sheer horsepower output but still does not leaves it much behind. This is because of the big weight difference of the bikes. The Pulsar 220F weighs 150 kgs while the Yamaha R15 weighs 139 kgs. This difference of 11 kg in their weights nullifies any power advantage the Pulsar has over the R15. Another thing to be noted here is that the rider’s weight also can create a lot of difference in the final result. That is why professional riders are required to be very fit and not become overweight. Aerodynamics and rider experience are among the other bits that matter when doing such high speed runs. As for this comparison, it is a tie and none of them could be said to be a clear winner here. « Honda Civic spied in India again, looks GORGEOUS!